Mures Tasmania is a proudly Tasmanian-owned and family run business who pride themselves on the quality and freshness of their products. Mures Fish Centre at Victoria Dock is a Hobart icon, with their own boats catching the freshest fish possible and serving up the best and tastiest fish and chips and gourmet meals – with Mures Upper Deck serving premium a la carte seafood with sensational views of the working fishing docks. Icecreams, beverages and cakes and breakfast are also available from The Cafe, and Orizuru Sushi Bar provides a taste of Japan on the Hobart Waterfront. Mures also produce a range of products including smoked salmon, ocean trout and silver warehou, a range of fish soups, gravlax, pates, roulade, terrine, sauces, marinades and other delicacies. An excellent selection of fresh fish is available from Mures Fishmongers, most of which is caught by their own fishing boats, as well as dive caught and farmed seafood. Mures have had a long affinity with our local region, sourcing mussels and scallops from Tasmania’s east coast. The BCFM warmly thanks Mures Tasmania for their generous sponsorship of the Bream Creek Farmers Market Cook Book. Summer is the perfect time for sitting on the docks and eating the best and freshest fish and chips in town, followed by an ice cream of course! So pop into Mures soon with your friends, kids and visitors – you won’t be disappointed. 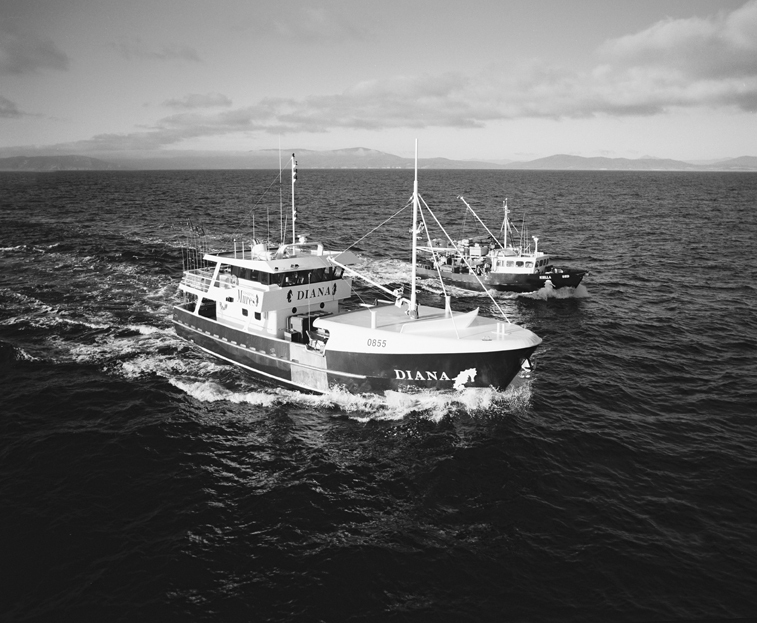 Mures are proud supporters of the fishing and aquaculture industries in our region and source their scallops from Tasmania’s North East, East and Lower East Coasts. The pure, clean waters around Marion Bay are perfect for growing some of Tasmania’s best scallops and this recipe combines the fresh, sweet scallops with a Mediterranean inspired coulis. Slice each piece of prosciutto into 4 strips. Wrap each scallop in a piece of prosciutto and set aside. Heat a frypan over medium heat and sauté the sliced onions, garlic, chilli, thyme and roasted peppers for 3-4 minutes. Add the wine to the pan and simmer until the volume is reduced by half. Peel and dice the tomatoes. Reduce the heat to low, add them to the pan with the olives and cook for 10 minutes. Add the salt and pepper and a dash of tabasco. Transfer the mixture to a food processor or blender and process until smooth and then pass through a fine sieve to create a silky texture. Heat a frypan over medium heat, melt a knob of butter and pan fry the prosciutto wrapped scallops on both sides until golden. To serve, spread the coulis on the plate, lay the scallops on top and garnish with chervilini. Ligurian olives are small black olives with a firm texture and a sweet, nutty flavour. Substitute your favourite black olives if you prefer. Chervilni is a baby chervil and has a slightly anise type flavour. Mature chervil can be substituted.